Hulk is the Most Popular Avenger Compared to Iron Man, Thor, and Capitan America Based on Online Search Volume from Google, Yahoo, and Bing. Increase shows popularity of Marvel’s The Avengers. As most people know by now Marvel’s The Avengers broke world and intergalactic records for movie attendance last weekend making the opening the largest in history. Disney and Marvel Executives should be happy that the movie paid for itself in the first week. We have been studying online search and news trends for the various Actors and Characters in The Avengers for the past year and found some interesting results. 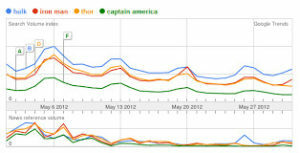 Based on worldwide search volume for the past 12 months, The Hulk is the most popular Avenger. With a search volume index of 1.32 The Hulk had more interest than Iron Man (.94) and Thor (1.0) who battled it out for the second most popular Avenger. Captain America had an index of (.48) and Loki (We included Loki, so that he does not get mad at us) had an index of (.24). Captain America and Thor did have spikes in search volume as their individual Marvel Movies came out earlier in 2011. The brand name “Avengers” was the most popular over the past 30 days with an index of (6.3) and lead in news mentions and social media. It was interesting to watch search volume grow as the movie became closer to release, with spikes in volume on April 28th and May 5th, the day after the releases in Europe, Australia and then in the United States. In addition we monitored various actors’ names and movie content key phrases with some long tail search terms increasing in volume after the movie was released. Specific keywords and key phrases included: “Ashley Johnson”, “ Who was waitress in Avengers?”, “ Shawarma” and “Avengers Extra” all spiked. Our advice to clients who are event driven is to optimize content for main key phrases and event titles, dates, and locations but also for key phrases that are specific to the event and have a longer shelf life. As some questions from movies and events will now be part of trivia or history. Examples include trade show names, cites and dates, keynote speaker names and bios, sport scores, results, and outcomes of the events that are related to a company or its products and services.